The most important thing to remember if keeping eastern bearded dragons outdoors, is to provide an escape-proof enclosure with plenty of high perches and basking spots, offer plenty of food and let lizards do the rest. Eastern Bearded Dragons belong to the Agamidae family and average snout to vent length in adults is 25 centimeters. They have a well-developed "beard" and a strongly depressed body. The inside of their mouth is usually bright yellow. There are many colour variations from grey, yellowish-brown, brown, to reddish-brown etc. Mature males develop a dark grey to black beard and a pale green to blue tinge on the forehead. Eastern bearded dragons are found in woodlands and dry sclerophyll forests extending into many urban areas in eastern Australia from Cooktown in Queensland to south eastern South Australia. Their habitat is mostly terrestrial and arboreal, preferring elevated perches such as sumps, fence posts, or rocks. they shelter in hollow logs, shallow depressions beneath vegetation or surface debris. Eastern bearded dragons (Beardies) regularly display courtship or defense actions such as head bobbing, arm waving, head licking, push ups, pawing of substrate, biting, erection of beard, expanding their body and colour changes. Up to 75 separate display sequences have been observed. In the wild, beardies forage for insects including ants, spiders, small lizards, flowers (especially low, daisy-like species and pansies or violas), fruits and green shoots. Mating occurs in the spring and gravid females are found from October to February. Clutches of 8 to 35 (average) eggs are laid in shallow burrows and sometimes 2 clutches are laid per season. Eggs hatch at around 54 - 60 days at 30 degrees Celsius. Bearded dragons usually hibernate in the winter but in captivity it is often wise to maintain hatchlings at around 25 degrees and feed weekly to maintain healthy growth. In captivity, eastern bearded dragons food should be dusted with calcium and vitamin supplements at least once per week. Good brands are Herptivite® or Rep-Cal®, available at most good pet stores. Suggested insects to feed captive beardies include crickets, wood roaches, mealworms (only adults), grasshoppers, flies, butterflies, bettles, Garden worms, and pinkie mice are also favourites as well as most soft fruits such as melon, berries, grapes, strawberry, apple, and green vegetables and shredded carrot and sweet corn niblets. Flower favourites include hibiscus, dandelions, carnation, squash, clover, nasturtium and daisy. Always chop fruit and vegetables into very small (finely diced) pieces. As hatchlings, beardies will live happily in a 30cm x 30cm x 60cm aquarium with a mesh top but as adults, will require much more room as they like to climb and bask. Newspaper makes the most convenient and hygienic substrate for the floor of the enclosure and should be changed at least per week or more often if necessary. UVB light is essential for most reptiles. Ordinary fluorescent tubes are useless as they provide light only - not UVB that is required for healthy bone development and assists in th digestion of food. The light will need to be within 30cm of the animals to effective. Beardies also need to keep warm, especially after eating as they cannot digest their food properly without adequate warmth. Around 25 to 30 degrees through the day and from 20 to 15 degrees overnight. Bearded dragons are diurnal (active during the day) so if you don't have timers fitted to your lights or thermostat, make sure that you manually switch on the UVB light first thing in the morning and turn it off again at dusk. Beardies can make excellent pets and are easily "tamed". They respond well to lots of handling (often and short is best). Always support a reptile's belly from below. Eastern Bearded Dragons like a large, shallow water dish that they can "swim" in. The Bearded Dragon is a friendly, sun-loving, terrestrial lizard that favours elevated perches such as tree stumps, fence posts or rocks as basking sites, and seeks shelter under debris or vegetation. They are diurnal, which means they are active during the day. Adults reach a maximum size of approximately 50cm (snout to tail) and reproduce by laying eggs. Sometimes referred to as Pogona, this includes several species of medium-sized built lizards. Bearded dragons are named for their distinctive flap of skin which lies below their jaw. When threatened, these lizards assume a defensive posture, opening their mouths and pushing their throat skin forward to make this "beard". Considered as a very social lizard, Bearded Dragons have a rich gestural language--bobbing their heads at one another, gaping their mouths, flattening their bodies and tilting as they circle one another, swishing their tails, using their tongue to check each other or their environment out. The first described species of the Agamidae family of lizard was the Eastern Bearded Dragon (Pogona barbata) found in the east and south-east of Australia. Up until recent years, many other species in the genus were incorrectly diagnosed as this species. Growing to around 60cm (24in), the Eastern Bearded Dragon is the largest of the genus Pogona which is endemic to Australia. It is usually grey in colour although some specimens are more brown in colour. They live in a semi-arboreal habitat, around fallen timber, tree stumps and fence posts. 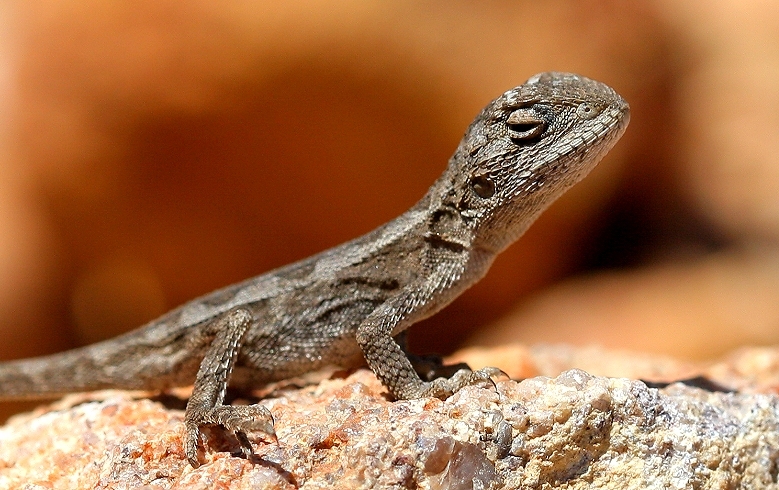 In the south-west of Western Australia these bearded dragons inhabit the coastal dunes and arid shrublands. Whilst on larger islands off the mid-west coast their habitat varies from limestone soils supporting heath lands and shrublands to sandy areas vegetated with beach Spinifex. Domesticated Pogonas especially the Pogona vitticeps (Central or Inland Bearded Dragon) are found in the semi-arid regions of Australia and very often kept as pets. Bearded Dragons are next to leopard geckos as the most commonly kept pet reptile among pet keepers and hobbyists. They are considered a beginner pet reptile yet they do require a more complex enclosure, diet and utmost care. Bearded Dragons are omnivores and require a varied diet of insects and vegetables. Crickets and cockroaches are some of their favourite foods. Feeding time is something that many bearded dragon owners look forward to. Dragons tend to be very enthusiastic when it's time to feed, and they can turn an ordinary meal into a sort of comedy routine. Hygiene is critically an important factor when keeping bearded dragons. It is very important to ensure that food and water are clean and not soiled. An adequate sized enclosure for a mature Bearded Dragon would be four foot by two foot. The dragon enclosure can be made from either wood, glass or fibreglass as long as it has adequate ventilation to allow for air flow. Ultraviolet light is necessary for Bearded Dragons for calcium metabolism. This can be provided by artificial "UV lights" or by natural sunlight, unfiltered by glass or plastic. During nighttime, a source of heat maybe produced by either reflector light bulbs, heatmats, ceramic bulbs etc. You can put some plants in with your Bearded Dragon but you have to make sure the plant and the dirt is completely free of pesticides and chemical fertilizers. Bearded Dragons have overtaken the Green Iguana and even the geckos as the most popular reptile pet. With their unique appearance, attentiveness, docile nature, and simple care requirements, they make intriguing pets. Australian Bearded Dragons are one of the easiest pet lizard to look after. Provided you can care for them regularly--clean their water and food dishes daily and keep their air temperature in their terrarium between 24 degrees to 35 degrees Celsius, things should run very smoothly for this rare find and interesting pet lizard.